HOLLYWOOD, FL, May 19, 2010 – SuperClubs, the world’s only Super-Inclusive resort group, goes after more fun under the Jamaican sun this Fall. To appeal to more travelers based on customer and industry feedback, Hedonism III in Runaway Bay will re-launch as SuperFun Beach Resort & Spa on October 14, 2010. Couples and singles (18 and over only) will enjoy fun-tastic amenities as well as more affordable rates, starting at $110 per person, per night, double-occupancy. While the property is being re-vamped (August 22 to October 14), bookings will be honored at the legendary Hedonism II in Negril. “With the successful Breezes re-branding in 2009, we’ve listened to our guests and travel partners yet again, and to meet their needs and to further support Jamaica’s growing tourism sector, we’re welcoming SuperFun Beach Resort & Spa to the SuperClubs family,” said Paul Pennicook, president of International Lifestyle, Inc., the worldwide representative of SuperClubs Resorts. Located on Jamaica’s famed north coast, the SuperFun Beach Resort & Spa will boast 210 rooms and 15 suites with expansive ocean and pool front views, multiple dining options including Japanese, Italian and authentic regional cuisine, the world’s only see-through-bottom Jacuzzi, a four-story waterslide, three freshwater pools, a clothing optional beach, and spa facilities. An all-inclusive SuperFun Beach Resort & Spa getaway will continue to include: accommodations, all meals, unlimited local and international brand cocktails, myriad land and non-motorized water sports including equipment rental and instruction, entertainment, weddings, recreational activities, and hotel taxes. Tipping is not allowed. Innovative Japanese fare in a casually elegant atmosphere with a sushi bar and Teppanyaki stations, where chefs prepare dishes to order. Reservations required. Open Saturday – Thursday from 6:30p – 9p (Closed on Fridays). With a perfect off-ramp for people on the fast track and tucked away on the finest expanse of beach on Jamaica’s famed North Coast, Breezes Runaway Bay Resort & Golf Club remains one of the world’s truly great escapes. With 266 rooms set on more than twenty-two lush oceanfront acres, Breezes Runaway Bay Resort & Golf Club feels worlds away from reality. As soon as you arrive, their longtime employees welcomes you with open arms and makes you feel as you are at home at once. In addition, with our attached 18-hole PGA golf course this retreat has all the amenities of resorts three or four times its size, but without the hassle of being far from the beach or the restaurants. It is all designed for you to get the most out of your vacation! Full-service spa featuring the signature three-hour “Blue Mahoe Spa Package” that includes four enticing treatments; Island Coffee Mint Glo, Tropical Body Mousse, 60-minute Blue Mahoe Massage and Tropical Fruit Facial. The NEW Breezes Runaway Bay features 266 rooms including 30 brand new ocean front rooms & suites and 236 newly refurbished guest rooms & suites. All rooms are air conditioned with private balconies overlooking our lush gardens or pool. Equipped with radios, CD players, alarm clocks, satellite TV, safety deposit boxes, hair dryers, iron & ironing board, coffee makers in the bathrooms, telephones. 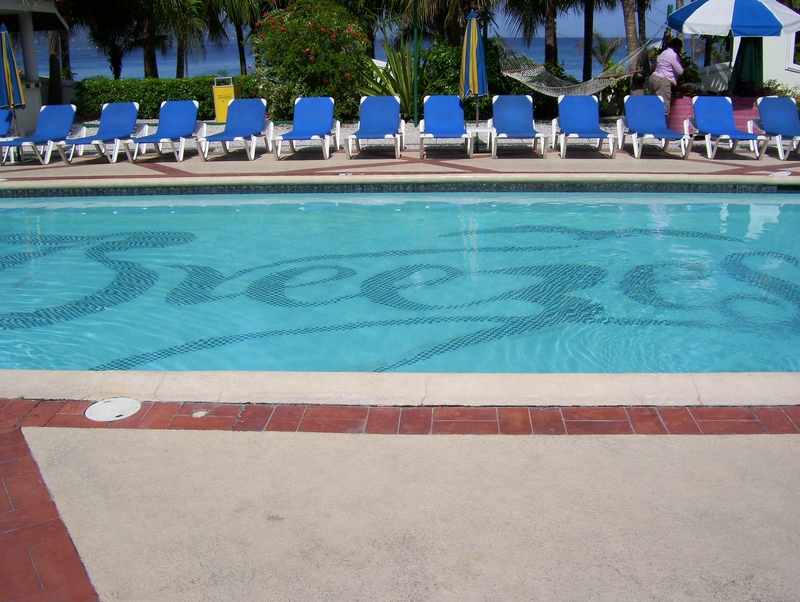 Here at Breezes Runaway Bay Resort & Golf Club everything is included. Searching for the perfect all-inclusive vacation? Well, search no more. You’ve found a paradise of fun in the sun for the entire family here at Starfish Trelawny Resort & Spa. Situated on a three-mile stretch of powder white sands and sparkling sapphire waters on the magnificent island of Jamaica, Starfish Trelawny serves up a healthy dose of food, fun & entertainment for everyone. Adults and kids of all ages will greet every sun-drenched day with a splash in any one of our four swimming pools throughout the resort. This watery wonderland boasts an enormous kids pool complete with splashing waterspouts, fountains and an incredible 124-foot waterslide winding its way through. Meanwhile, the adults-only pool, swim-up bar and 84-foot winding waterslide is sure to keep the grown-ups afloat. Starfish Trelawny has something for everyone – families, couples & singles. Starfish Trelawny offers six dining options with even the most eccentric traveler in mind. From Hot Dogs and Hamburgers to Tepanyaki and our world famous Jerk Pork, our dining outlets are bound to please your eager taste buds. Buffet style breakfast, lunch, dinner or even a midnight snack is offered in the Starfish Buffet. This open-air restaurant is draped in the back with majestic coconut palms, fruitful mango trees and lush bamboo reeds, gaily dancing in the cool island breeze. Our open-air kitchen gives you the opportunity to have your meals cooked to order as our award winning chefs aim to please and pamper. Casual dress or beachwear (with appropriate cover up) is acceptable! Starfish Trelawny boasts an impressive 350 rooms, inclusive of 37 pool & garden cottages and one presidential suite. Our majestic main building houses four towers each with impressive ocean, mountain, pool and garden views. Tower rooms are divided into two categories: Standard and Superior, with a maximum of two adults and one child to each. While our more spacious Cottages accommodate a maximum of four persons: 2 adults and 2 children OR 3 adults and 1 child OR 3 adults maximum. All non-motorized water sports activities are included in your package and you don’t have to pay extra like at most resorts. Frolic in our crystal blue waters while you sail on a Hobie Cat, windsurf or go kayaking! If you have never tried any of these or your not an expert, don’t worry, even instruction is included! For those of you that are thrill seekers and aren’t satisfied with the power of the wind, you wont be left out. Scuba Diving, water skiing, parasailing, banana boat rides, snorkeling trips and jet skiing are available at an additional cost. Kids are the most important part of the magic! Kids bring with them a special kind of magic and we love to see the smiles on their faces when they see all we have in store for them. Our supervised Kids Club is available for a small daily fee, open from 9:00am – 5:00 pm. In addition we offer, water sports, pools, slides, circus, tennis, basketball, beach and private theme parties, tennis, games, and contests! If you would like to dine alone to renew and rekindle the romance in your life, babysitting is offered after 5:00pm and a charge is applicable. All you need to do is inform us at the hotel whenever you request this service and we will take care of everything else! As if by magic, a replica of an old-fashioned Jamaican village welcomes you, with gingerbread architecture, a town square, skilled craftsmen and coconut vendors of selling their treasures on the cobble-stoned streets. Needless to say, the old-world setting has been wedded to today’s luxury amenities to create the world’s first Super-Inclusive Jamaican Village. Travel + Leisure magazine, in its August issue, unveiled its much-anticipated World’s Best Awards 2007. Grand Lido Braco Resort & Spa was ranked among the Top 5 Hotels in Jamaica and the Top 20 Hotels throughout the Caribbean, Bermuda and the Bahamas. Here, anything’s possible and everything’s included. Luxurious accommodations, In-room Dining, Sumptuous cuisine, Premium brand bar drinks, Championship golf and tennis, Sailing, snorkeling & scuba, Scintillating nightlife, Perfumed gardens and Separate au naturel facilities; all to give you your ultimate lavish Super–Inclusive vacation! Looking for Entertainment? A Jamaican Street Party is the highlight of revelry after dark. The fun wanders along four village streets where guests learn to dance local rhythms, old and new, and dinner is served under the stars. By day, the comprehensive sports program keeps you fully occupied. Why not Golf at the PGA-quality course at Runaway Bay. And yes – this too is included. No wonder the hours pass so quickly. You’ve walked the beach at dawn, hand in hand – and before you know it you’re sipping champagne again, enjoying the sunset. Grand Lido Braco Resort & Spa welcomes singles, couples and families, 16 years and older. Awarded the TripAdvisor.com 2009, Best For Families World and Best for Families Latin America/Caribbean, Pebbles Resort is just a 25 minute drive from the Montego Bay airport. Pebbles offers families an authentic, beachfront Jamaican holiday experience in a cozy, all suite, all inclusive setting, with a hint of adventure. Participate in a friendly soccer game, take a family walk down the beach or enjoy great fun in the ocean on a kayak, sailboat or snorkeling. Venture out with the kids on a glassbottom boat ride. Pebbles sits upon an untouched bay in the glistening Caribbean Sea. From cricket lessons to Jamaican cooking classes to swooshing down the 100’ Big Red Waterslide to Marshmallow roasts on the beach, the fun at Pebbles is never ending. Our Yellow Bird Kids Club is open from 7:30am-10:30pm daily and features arts and crafts activities, picnics, theme parties, fashion shows, scavenger hunts, beach games and much more for the kids. You can find some great spots to do as little as you want. Pre-teens and teens are special here, with cool activities like a one night camp out, fishing, beach volleyball, cycling or just hanging out in their games room with computers, Xbox 360’s, WII’s, ping pong, pool or foosball games. With the kids entertained, Mom and Dad can meet great people and enjoy tropical drinks by the swim up pool bar, tone up and get fit in the workout gym, or enjoy an Oceanside massage at the Spa. PADI Certified Scuba diving is also available on property. With a staff to guest ratio of 1:1 at Pebbles Resort, families are treated to a Three-in-One Vacation. A fun and exciting activity filled vacation for the kids, An intimate escape for Mom and Dad, and a carefree and relaxing holiday for the family! The Gran Bahia Principle Jamaica is situated on a private beach and is only 45 minutes to a hour from the Montego Bay airport in Runaway Bay, Jamaica. This great hotel has a total of 680 rooms, all of which are Ocean View Junior Suites. Each suite offer many features such as: air-conditioning, fully-equipped bathroom, hairdryer, Satellite TV, direct telephone line, personal safe in the room (extra charge for usage), fulled stocked mini bar that is refilled daily and a terrace. The Gran Bahia Principle Jamaica offers two lagoon style swimming pools that are connected to each other and surround the main building, with a children’s section, a large solarium and gardens with sunshades and loungers. The wedding gazebo for weddings offer a view that is truly overwhelming. Looking out over the ocean feeling the breeze from the ocean makes any wedding here a truly memorial event. There is one international buffet, 4 restaurants on the property that offers a la carte specialities, 5 bars including a swim-up bar, a SPA, gym and so much more. We had lunch in the international buffet restaurants during our visit and believe me when I tell you that the choices are great, selection is over the top and the service is truly the best.